About Cláudia B. Message Cláudia B.
Claudia was punctual in picking us up at our Lisbon apartment. Her vehicle was very comfortable. She enhanced our experience by pointing out various sites along the roadways. She was so flexible which allowed us to experience the destinations at our pace. Obidos was a wonderful walled village. Peniche, not a typical destination, had amazing views of the Atlantic from the rugged cliffs. Ericeira was her recommendation and a great conclusion to our tour with it's picturesque scenes of the town & ocean. Our custom tour to Tomar with Claudia was EXCELLENT!!! She picked us up at our Lisboa apartment. During our drive she gave some history of Portugal as it pertained to the Knights Templar, the Convent of Christ and the town of Tomar. The tour through the Convent of Christ was very well done with just the right amount of details provided. Claudia delivered on a special request to visit the aqueduct. Her suggestion for lunch was very good. Not a typical destination, but we highly recommend it & Claudia. TOUR GUIDE RESPONSE: Thank you so much for your kind words, Scottie!!! It was a pleasure to meet you and your friends and show you a bit of my country! I wish you all the best! Cláudia was very friendly and really knew her history. Learned a great deal about the city and it's history. Glad to recommend her to everyone! TOUR GUIDE RESPONSE: Thank you so much for your kind words, Iain! It was very nice to meet you and your family! Claudia was an incredible guide. The best my wife and I have ever toured with - and that's really saying something. Here's why: 1. She was incredibly thoughtful and accommodating of our interests and physical limitations; 2. Her knowledge of the city, its history, architecture and neighborhoods was encyclopedic; 3. She was fun and easy to engage with. We would like Claudia to move to the next two or three cities to which we are planning visits so that she could guide us in each - she is that good! TOUR GUIDE RESPONSE: Thank you so much, Robert, for such kind words! It was a pleasure to meet you! I wish you all the best! 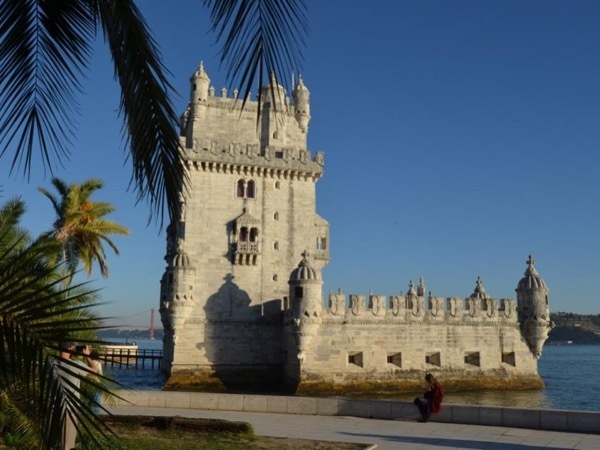 My and wife and I would highly recommend Claudia for tours in Lisbon and the surrounding area. She was very knowledgeable and provided us with great information of Lisbon. She provided a nice clean vehicle, was a great driver and was willing to change the tour per our requests. A pleasure to be with on two different tours of the Lisbon area. TOUR GUIDE RESPONSE: Thank you so much Tim! I really enjoyed meeting you and showing you my country! All the best to you and your family! TOUR GUIDE RESPONSE: Thank you so much Michael! It was a pleasure to meet you! I hope the next time you come to Lisbon it will be sunny! Cláudia was wonderful! Very knowledgeable about Lisbon, Sintra, Cabo da Roca, Cascais, and all the towns along the way. Her tour of Pena Palace was OUTSTANDING, we couldn't have asked for a better experience. We asked lots of questions and Cláudia answered them all while providing even more information along the way. Thanks, Claudia, for sharing Portugal with us and for a fantastic day!! TOUR GUIDE RESPONSE: Thank you so much for your kind words, Becky! I had a great time in your company, it was a pleasure to show you my country! Hope you are having a wonderful vacation! Cláudia was a wonderful, warm and accommodating guide. We loved her and can't wait to come back!! TOUR GUIDE RESPONSE: Thank you so much Jeff! It was a pleasure to meet you and your lovely family!!! Enjoy Lisbon! Claudia led a great tour. TOUR GUIDE RESPONSE: Thank you so much Michael! It was a pleasure to meet you and your friends and to show you my city! I wish you all the best! Claudia was amazing from start to finish. The day was very special and she made us feel very welcomed. TOUR GUIDE RESPONSE: Thank you so much for your kind words, Karen! Ir Washington a pleasure to meet you and your friends! Best regards! Claudia was so pleasant and knowledgeable. This was our first visit to Lisbon and she gave a great historical overview and well as taking us to some beautiful overlooks and through some interesting architecture. And the custard tarts! - the highlight! We highly recommend Claudia as a guide. TOUR GUIDE RESPONSE: Thank you so much Robin! It was a pleasure to meat you and show you my city! All the best for you! We had an amazing full day tour. Great stops - be ready for a fair bit of walking. Claudia was absolutely an amazing guide. She knew we need to start early to miss lines at Sintra and she was 100% right - line was huge an hour after we were already through. She also customized our tour a bit due to my mother in-laws limited mobility. Had an amazing lunch in Cascais and a wonder coastline tour back to Lisbon. Highly recommend the tour - especially Claudia. TOUR GUIDE RESPONSE: Thank you so much Daniel! It was a pleasure to show you my country! I had a lovely day as well, all the best to you and your family! Claudia B. Was wonderful. We asked her to customize the tour and she went over and above to satisfy us. Once the tour started she was knowledgeable and interesting. We spent the entire day with her and by the end of the day we felt like we were friends. We recommend her highly! Mrs Claudia is a nice person and a great guide . We thoroughly enjoyed our tour of Lisbon with Claudia - she was friendly, very knowledgeable and helpful and her English was excellent. She obviously loves her city and is keen to share it and we'd be happy to give her 5/5 for the procurement of the Portuguese tarts alone! Claudia is lovely! She greeted us at the hotel with a warm smile and gave us a wonderful, comprehensive tour of Sintra and the surrounding countryside. Claudia wanted us to enjoy ourselves; we never felt rushed as we wandered through the castle and the shops. She obviously loves what she is doing and has all the information at her fingertips. Plus her English is clear and understandable. All in all, I would choose Claudia to serve as our tour leader if we are lucky enough to return to Portugal. TOUR GUIDE RESPONSE: Thank you so much Ellen! It was a pleasure meeting you and your lovely family! All the best! The tour with Claudia was amazing! More than we expected! Its just a profi, experienced and easy going person, who does her job just in a perfect way! Meets the requirements of the customer, understands the wishes and needs of it. Very good sense of humor. I am so happy I picked her for the tour. Claudia is a hard worker, with great English and a nice person. Definatelly recommend Claudia! She is a fast replier, quick minded and flexible! The was beyond my expectations. So proactive Thank you, Claudia!